The Deluxe LU053Q SuperCycler works with all Lumedyne Battery Modules, (Mini, Regular, Super and Ultra) to provide Super fast recycling and tremendous flashes per charge for most shoe and handle mount flash units. 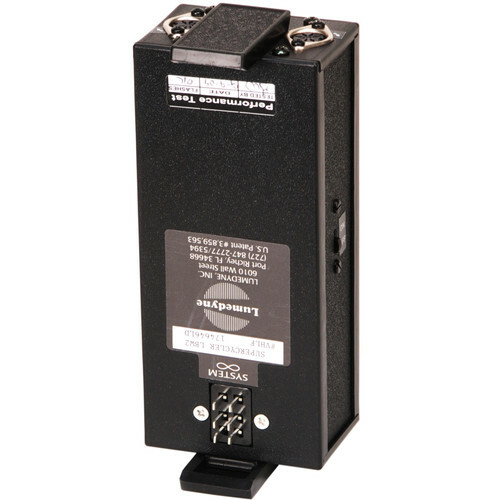 This unit features dual recessed connectors with short circuit protection and a Low Battery Warning, "LBW", indicator. Dual Recessessed Power Connections with Short Circuit Protection. An inexpensive way to power shoe and handle mount flash units. Box Dimensions (LxWxH) 8.976 x 4.488 x 4.331"
HV SuperCycler Pack with Dual Connector is rated 4.7 out of 5 by 3. Rated 4 out of 5 by Thomas Graves from run two speedlights on one stand I've been a Lumedyne user for 20+ years, and they have never failed me. Now with this unit I can put two SB-800's on one stand and run a power cord to each one from the one powerpack, saving weight and space. Recycle times are great, even with the small battery, and it keeps me going for hours. Most useful and efficient. Rated 5 out of 5 by Pixel Pete from exactly what I was looking for I was looking for an external power pack for my Canon 580EX speedlight, something more environmentally friendly and the Lumedyne Supercycler match my needs. I bought the Medium battery to go along with the Supercycler. Sure, it costs more than the other external power packs but I can fire at least 800+ full power flashes. I don't recommend you do that, however, you'll be in the market for a new flash because it's easy to forget most Speedlight manufacturers tell you to shoot no more than 20 continuous full power flashes. Rated 5 out of 5 by Nate in Maine from Excellent for use with Quantum Q-Flash I purchased the SuperCycler with Large Battery to replace the Quantum Turbo battery pack for my Q-Flash. I use Q-Flash when photographing weddings. I can shoot all day long - including fill flash in direct sunlight - and still have battery power. The Large Battery lasts about the same as 3 Turbos. Extremely reliable. I purchased a small shoulder bag to hold the SuperCycler/Large Battery combination. DO NOT USE the Lumedyne strap adapter - it's totally useless. Will this work with the older qflash T-5d or the Qflash model x-2? The Quantum X-series use proprietary batteries only manufactured by Quantum Instruments and will not be compatible with the Lumedyne HV SuperCycler Pack. Quantum Qflash X models cannot even use Quantum Turbo batteries.